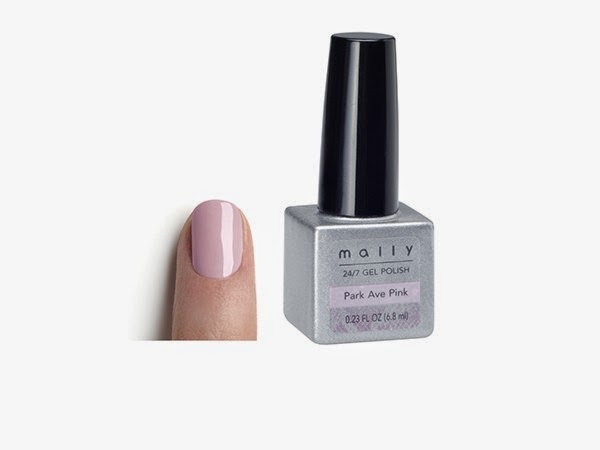 Mally has came out with a new 24/7 Gel Polish, which is explained as an eye popping "gel like" polish that will make your nails not only look fabulous but will give you the look and feel of the ever so popular gel nails. The shade I tried was "Park Ave Pink" which is a light sheer baby pink that is identical to the press picture shown above. So quick side story; I guess many of you will find this a bit silly, but when I received this, I read up about it a bit and tried to apply the polish, JUST as a polish. I tried 2 -3 coats of the "Park Ave Pink" but it kept looking streaked and then it would just slosh off. I was frustrated thinking, "Mally what are you doing?!!? How could you create a polish that is sooo horrible? " I debated on how I was going to write up this review on a brand I usually love so much but a product I was dissapointed on, but THEN as I was reading up on this product a bit further, I realized you need the "Gel Machine" in order to get the correct results you want. Ha! Ok well I don't have a Mally Gel Starter Kit, which means I don't have the actual "machine" the primer or the after care, but I do have a "SensationNal Gel Kit" Once I realized how silly I was, putting this on as a "stand alone nail polish," I used my "SensationNail Kit, and applied THEIR primer, then the Park Ave Pink color, just as I would with all my other SensationNail Colors, (if you have this system then you are familiar) and WOW the color IS gorgeous and did work after I cured and buffed my nails, just as you would with the SensationKit. So although I'm not promoting the SensationKit, Or I wasn't planning on it in this post, I wanted to let everyone know, because after reading a lot of Amazon reviews, I'm not the only person that thought this was just your basic polish, this is a gorgeous color, and won't come across streaky at all if you apply it right, WITH a Gel Polish Machine. And if you don't have one I highly suggest it because they are great for when you're in a hurry and need a manicure. Silly right? I feel completely dumb, but glad that once again Mally did not dissapoint.